The Fontana di Trevi, scene of movie star Anita Ekberg's late-night dip in La Dolce Vita, is a flamboyant baroque ensemble of mythical figures and wild horses taking up the entire side of the 17th-century Palazzo Poli. After a Fendi-sponsored restoration finished in 2015, the fountain gleams brighter than it has for years. The tradition is to toss a coin into the water, thus ensuring that you'll return to Rome – on average about €3000 is thrown in every day. The fountain's design, the work of Nicola Salvi in 1732, depicts sea-god Oceanus in a shell-shaped chariot being led by Tritons with seahorses – one wild, one docile – representing the moods of the sea. In the niche to the left of Neptune a statue represents Abundance; to the right is Salubrity. 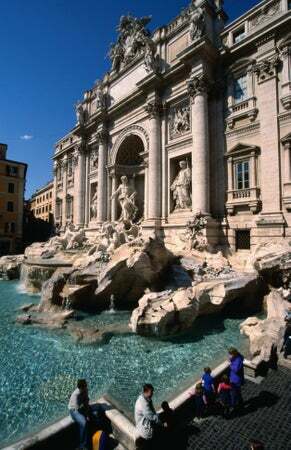 The water comes from the Aqua Virgo, a 1st-century-BC underground aqueduct, and the name Trevi refers to the tre vie (three roads) that converge at the fountain. Most famously, Trevi Fountain is where Anita Ekberg cavorted in a ballgown in Fellini’s classic La Dolce Vita (1960); apparently she wore waders under her iconic black dress but still shivered during the winter shoot. The fountain also featured in Jean Negulesco's 1954 film Three Coins in the Fountain , best remembered for its theme song sung by Frank Sinatra. The fountain gets very busy during the day; visit later in the evening when it's beautifully lit and you can appreciate its foaming majesty without such great hordes.